.. there were only four channels and you had to get up to change them!!! You had four? I’m jealous. We had three and one of them was government-run. I only had 2! And I had to eat coal for breakfast. Coal? That’s nothing – we had to eat oatmeal for breakfast. Oatmeal tastes great…once you douse it in brown sugar. Oooo evil… Makes me wonder if my VHS still works? I still watch all my Disney VHS tapes. I showed my nephews the Atari 2600 versions of E.T. and Pac-Man. I regret nothing! 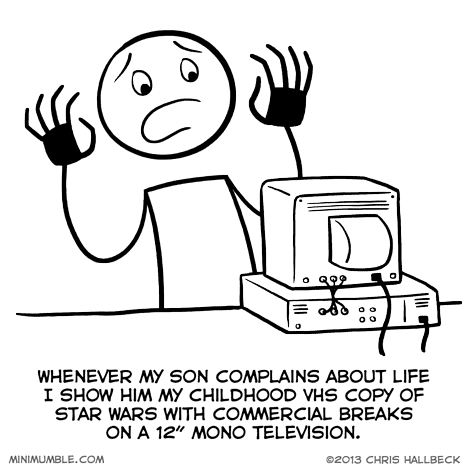 …pretty sure my own copy of Star Wars was just as bad as yours. Particularly because our VCR kept snagging the tapes, so they got worse with each showing. And yeah, I also only got two channels growing up, and BOTH of them were government-run. THAT was the main reason I started reading as a child.